I started this page because of my disappointment in the utter lack of reliable information on this subject in the net and in readily available printed sources. There is much misconception about this device and what I have found is really anticlimatic. The name, Nahverteidigungswaffe (Close Defense Weapon), evokes certain ideas about what this weapon should do. In actuality it is not really a weapon. It is an accessory. I couldn't find any direct evidence that would shed light on the development of this particular device. From what I did find it would seem that this system was developed due to combat experience with the external, turret-mounted Wurfbecher used to discharge smoke candles to provide concealment for tanks. There were instances of tank crews being incapacitated by the smoke from their own smoke when those candles were ignited by small arms fire. By moving the smoke discharge system under armor, the tank crews could be protected from this effect. Linked to this is the Germans' concern for protecting tanks against infantry in the close fight. Various models of german tanks featured pistol ports and plugs to allow the crew to fend off infantry that was too close to engage with the tank's main weapons. The Nahverteidigungswaffe represents the combination of the smoke discharging system with a close defense capability in tidy package. Many thanks to Mattias, Jean-Charles, Markus, Mike, Helge, Dr. Cameron, O.B., Charles and Candy for their assistance and comments. (they know who they are). This picture shows the smoke discharge system as mounted on the Tiger I (Ausf E) from August 1942 until . Likewise mounted on the Tiger I was a unique system of close defence that featured five small S-Mine dischargers spaced around the hull (3 on the left, 2 on the right). Like the smoke dischargers above, they were fired electrically from inside the tank. These were first installed in December 1942 and dropped from production in November 1943. I haven't been able to find any reports of their use in combat. The Nahverteidigungswaffe first appeared on the Tiger I in March 1944, although the machinepistol ports were deleted in January 1944 in anticipation of the Nahverteidigungswaffe. 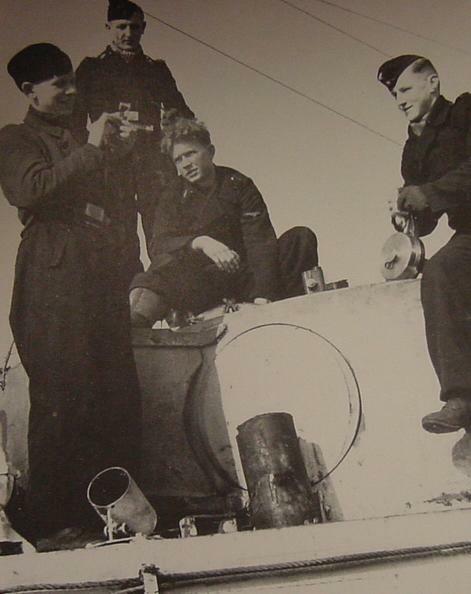 This image shows an S-Mine discharger (lower left) on the side of a Tiger of the SS Panzerdivision Das Reich. The turret is traversed to the rear leaving the escape hatch facing the discharger. In the normal arrangement of 5, the dischargers were mounted at the 4 corners and one on the left side of the hull where there was only a pistol port and not a hatch. The Nahverteidigungswaffe consisted of a circular plate and a launch tube that was bolted to the roof of the tank and covered with an armored plate. The launch tube had a hinged breech. The breech was opened and closed by the use of a locking handle. The handle was rotated 90 degrees clockwise to unlock the breech and allow it to be flipped upwards. After loading the breech was closed and locked by rotating the handle back 90 degrees counterclockwise. The base plate mounting had a locking screw to allow the operator to lock the NahVW in a particular direction. The launch tube was set at a fixed 39 degrees from the vertical. The diameter of the launch tube was 92mm. This image is from the Tiger B (Königstiger) and Panther turret manuals. Many thanks to Mattias for his kindness in providing the image. A very big version of this image is available at The Big Picture. 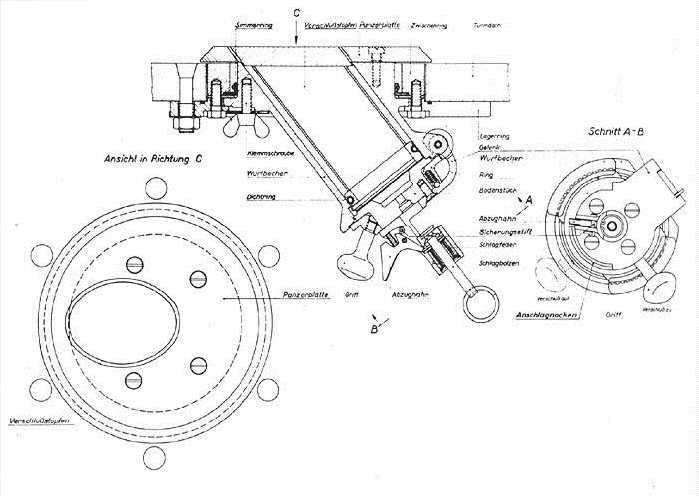 The Panzermuseum has posted their data from the Tiger B turret manual (D 656/42, Panzerkampfwagen Tiger Ausführung B, Turm Nr. 1 - 50 und Panzerbefehlswagen: Gerätbeschreibung und Bedienungsanweisung zum Turm, 1.2.1944) for those who would like to see the original German. These two images show the Nahverteidigungswaffe in the open position. The one on the right shows the Verschlußstopfchen (sealing plug) in place. 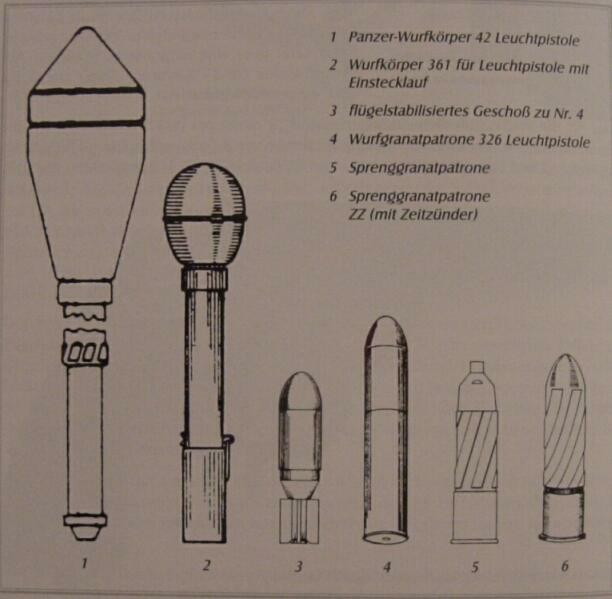 The Nahverteidigungswaffe could use a variety of ammunition types. Schnellnebelkerze 39, smoke candles. 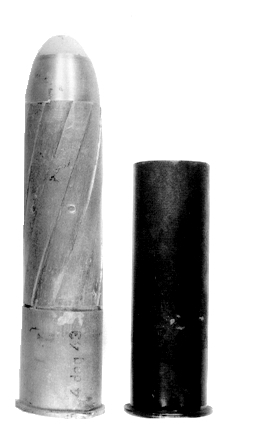 This was the primary ammunition type and the one that determined the diameter of the launch tube (92mm). A Sprenggranatpatrone of indeterminate type and nomenclature. The Tiger B manual calls for this round to be Sprenggranatpatrone 326 Lp. This must be in error as that particular round came only with an impact fuze and would be incompatible with the close defense concept. The Panther turret manual calls it the "2,6cm Sprenggranatpatrone mit Zeitzünder Lp" (explosive round with time fuze). This was a high explosive round that had a range of 7-10 meters and with the timed fuze of 1 second would normally explode 0.5 to 2 meters above the ground. 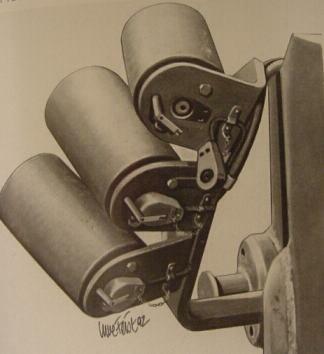 This round was fired from a normal Leuchtpistole (flare gun) or Kampfpistole (rifled flare gun) using the Nahverteidigungswaffe tube as a large pistol port. It was used to combat close assaulting infantry in the "dead zone" around the tank. The picture above and the drawing that follows below are of the original Sprengranatpatrone 326 Lp designed to be fired at ranges up to 400m. The impact fuze in the nose cone clearly indicates this. The round used to defend the vehicle had a timed fuze and wouldn't need an impact fuze. The HE charge was small and probably had less of an effect than a regular hand grenade fitted with a fragmentation sleeve. Research continues on the exact size and power of this grenade. The photo bellow is of the mysterious Sprenggranatpatrone mit Zeitzünder Lp and nex to it a schematic diagram of the standard HE grenade for the Kampfpistole. Below is a chart showing some of the variety of ammuntion types available for the Kampfpistole. The one of concern here is the one identified as #6, the Sprenggranatpatrone mit Zeitzünder. It can be seen that it is only slightly larger than the standard HE Sprenggranatpatrone which carried an HE charge of .77 ounces or just less than 22 grams while the larger Wurfkörper 361 had 112 grams of explosive in the Eihandgranate 39 (egg hand grenade) from which is was made. In addition the Rauchsichtzeichenpatrone was also known as the Deutpatrone Z and like other cartrdges with the Z was designed to be fired from the Kampfpistole and could not be used with the normal Leuchtpistole. There was not, as far as I can deteremine, a comparable round for the normal Leuchtpistole. This would indicate that the Kampfpistole was the actual device used in conjunction with the Nahverteidigungswaffe. 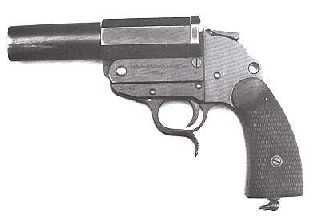 This is the standard Heeres Modelle Leuchtpistole (designed by Walther). Below is the Kampfpistole which easily identified by the prominent Z on the side. The following image taken from a late Tiger I manual shows clearly the method of using the Kampfpistole with the Nahverteidigungswaffe. 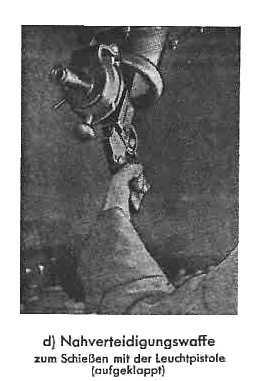 In this shot it is impossible to tell whether it is a Leuchtpistole or a Kampfpistole being used, but based on the rifling on the HE round it must be a Kampfpistole. The round shown above is the standard HE round for the Kampfpistole hence the name Sprenggranate für Kampfpistole. 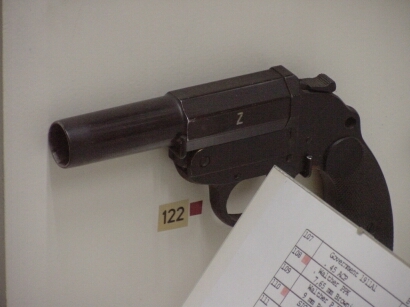 It also shows how the round itself was rifled to fit in the Kampfpistole so that while the Kampfpistole could use Leuchtpistole ammunition, the Leuchtpistole could not fire these rifled cartridges. It is apparent that the primary function of the Nahverteidigungswaffe was to place smoke candles. The size of the tube was determined by the size of the Nebelkerzen. The original Nebelwurfgeräte mounted on many vehicles were removed after incidents of small arms fire igniting the candles in the dischargers and the resulting smoke incapacitating crew members. The Nahverteidigungswaffe allowed the smoke candles to be discharged from under armor. 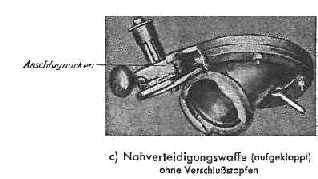 The Nebelkerzen were the only munition that the nahverteidigungswaffe actually "fired." The rest were fired using the Leuchtpistole/Kampfpistole. 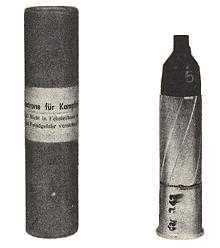 The Zündladung N4 is the blasting cap used to activate the smoke candle after discharge. It was inserted into the bottom of the smoke candle and then the Wurfladung was screwed into the cover the Zündladung. The round was then inserted into the launch tube. 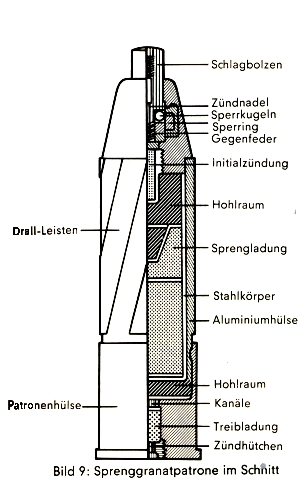 After the breech was closed the Zündschraube C43 St was inserted into the breech cavity and used to fire the Wurfladung and thus the smoke candle.